Local clean energy generation is an important basis for the energy transition, and solar energy is already economically feasible. This does not solve, however, the mismatch between solar production, at noon, and electricity consumption, at morning and evening. 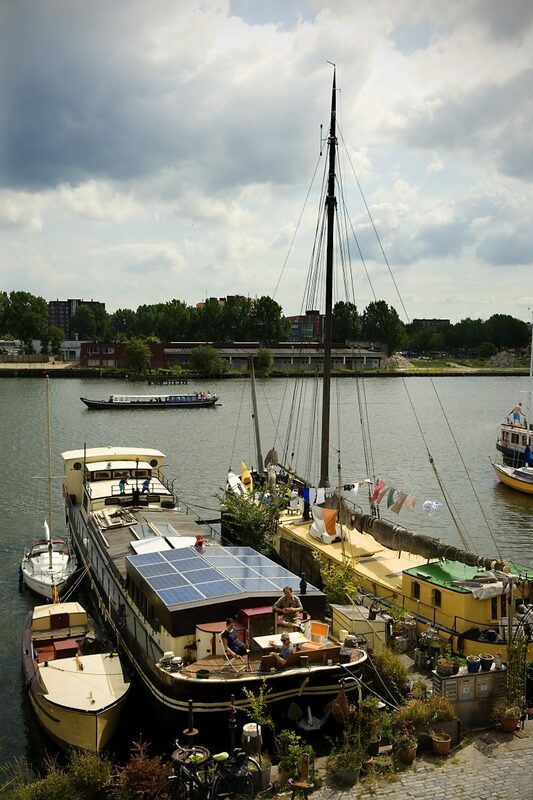 Amsterdam V2G uses 30 m2 of photovoltaic panels (purchased from greenfocus), with a total installed power of 4000 W. The total yearly energy production amounts 3780 kWh. Another urban development is electrification of transport. 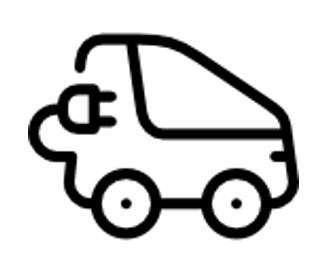 Electric driving reduces air pollution, is more efficient and relatively cheap. It can, however, aggraviate the peak of energy demand, since generally the electric car owner charges his vehicle after work. Therefore, during the evening demand peak. The grid is currently unprepared to address these eventualities. The use of EV batteries as storage provides a solution, enabling users to employ electricity captured in the car battery for domestic use. This means that the owner of both a solar energy system and an electric vehicle could store energy generated during peak production in the EV in order to use it when energy demand is higher. The logic seems clear; why not scaling up this technology to help whole cities in its enegy transition? Amsterdam V2G strives to be a reference in this transition. Amsterdam V2G uses an EV with a total battery capacity of 10 kWh, of which 7 kWh are available for storage. Solar energy production and electric vehicles pose two major drawbacks sepparately, but provide for a solution when unified. The flexible nature of charging (and discharging) provides a great opportunity for solving the urban mismatch between production and consumption of energy. If electric vehicles can act as a buffer between production of solar energy and consumption of electricity, reducing the peaks of demand. The technology is there, and the next challenge is addressing smart logistics and offering an energy taxation system that favors fair energy exchange for all stakeholders. 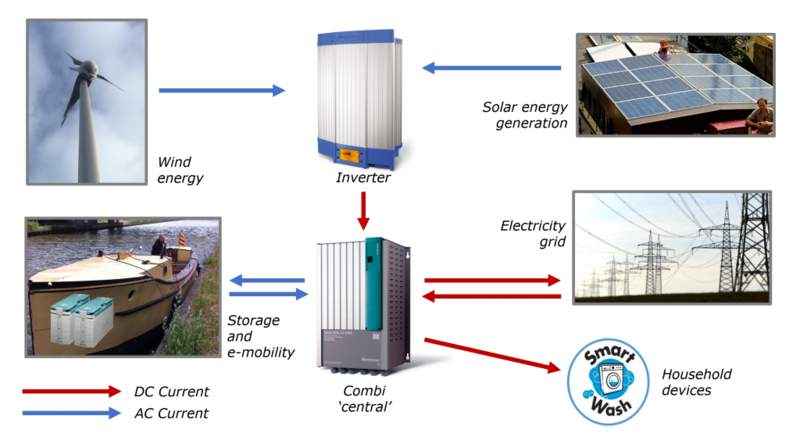 In Amsterdam V2G, the main focus is the optimization of local renewable consumption. 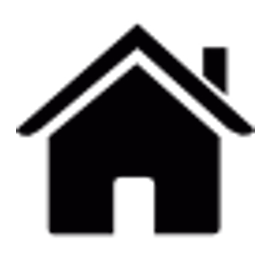 The extrapolation to neighbourhood and city level is under research. Amsterdam V2G is connected to the Amsterdam electricity network. 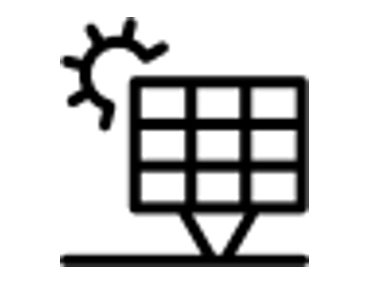 The system uses the grid effectively as an energy storage, allowing to withdraw an amount of energy equal to the one that was injected. Amsterdam V2G has also advantages for the grid, because it reduces greatly the flows of incoming renewable energies. 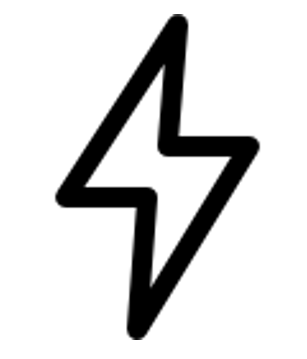 Too much influx can disrupt the grid, that is not especifically prepared for bidirectional energy fluxes. 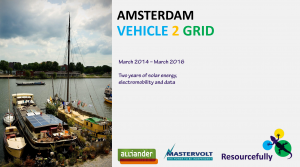 Amste rdam V2G household has an approximate yearly consumption of 3350 kWh. In order to manage effectively the distribution of energy between the home consumption, the EV battery and the grid, it requires a energy management system, provided in this case by Mastervolt. This energy management system contains the necessary algorithms to direct the flows of energy; a software that may be updated in the future in order to allow decision-making taking into account wather forecasting. The application of an energy management system also allows to explore another common issue in the V2G concept, the one of vehicle autonomy. The system in Amsterdam V2G allows to program a full charge of the EV on demand, but this is just one of several ways to address the issue. How to create acceptance? What is the minimum level of transport autonomy needed? This social challenge is another topic of study in the AmsterdamV2G project. The system became connected in March 2014. Before this, the household supplied itself with the installed PV. The objective was to observe how the behaviour of the system changed with the addition of an Electric Vehicle. Find below a more detailed scheme of Amsterdam V2G functioning. The real operation of the system requires, in addition to the aforementioned elements, an Inverter and a Combi, that manage the energy flows and switch between AC and DC current. This project is implemented by a consortium of three entities; this allows fast development and reduced project overhead.